This correspondence between Governor Schoeppel and O.M. Raines, addresses Raines desire to return to his pre-war position as a civilian doctor. 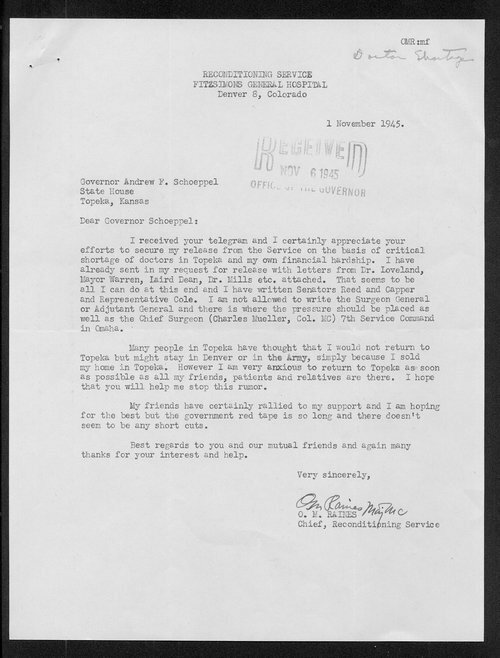 Serving as Chief of the Reconditioning Service at Fitzsimmons General Hospital in Denver, Colorado, Major Raines asks for Schoeppels help in exiting the military as soon as practicable given that World War II had just ended. This item can be used in conjunction with other items on the home front during World War II to provide students with insight into the difficulties that affected everyone during the conflict.